Antherina suraka — “Madagascar bullseye” | Welcome, visitor! Antherina suraka, the Madagascar bullseye moth, is a species originating from – who would have guessed – Madagascar. 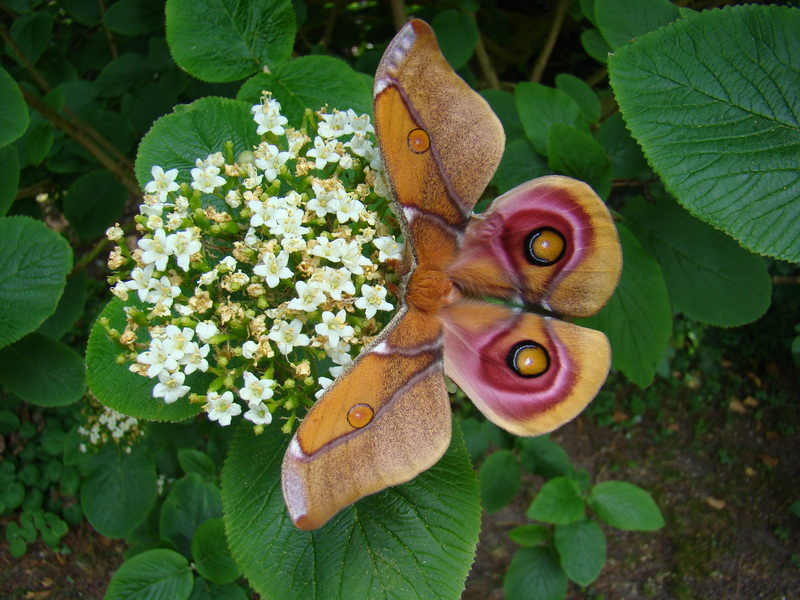 It is often seen in butterfly houses and in the insect hobby scene, for the moths have a nice appearance and are easy to breed without a lot of effort and are willing to eat convenient plants. Both larvae and adults are variable, having multiple colour forms and variations. They have the ability to move their hindwings independently from their forewings if startled in order to show off their eyespots in a rocking motion, something that may startle or discourage predators from attacking them. The evolutionary lineage of Antherina suraka is relatively unique and seems to have split off from Bunaeini/Urotini when Madagascar broke free from the continent of Africa – it’s only relative is Ceranchia apollina, that shares the same lineage and is regarded as a “cousin” of A. suraka. although yet very different in appearance and ecology. 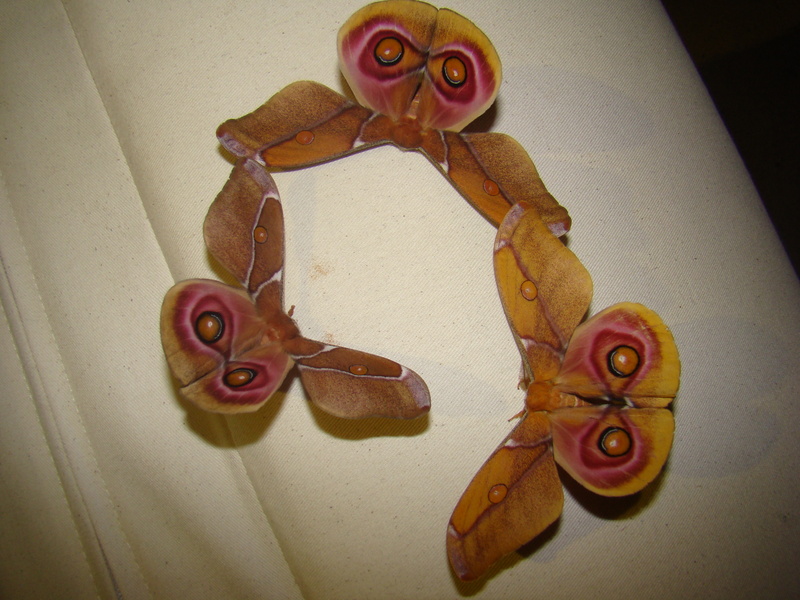 In captivity, these moths will be excellent for beginners, as both adults and larvae are very unique and colourful. It’s best to rear them on privet (Ligustrum) in captivity. However, it generally isn’t known they feed on quite a lot of other plants aswell, including Oleander (Nerium oleander) and other things (Prunus has been mentioned and so has Salix)! Eggs hatch in 10 to 15 days depening on the temperature (longer if cold, faster if warm). Room temperature is generally fine for all life stages, although they do handle heat very well, coming from Madagascar. Larvae can be reared in plastic containers up until the third instar (if not too humid) and should then be moved to a cage or appropriate sleeve to rear them in; ventilation is an important factor in preventing them from getting infected. Tiny larvae are black with yellow or orange spines. As they grow older, the final instars become more colourful and are very variable. The fourth and fifth instar come in a wide range of colour; the most common colour seems to be green (with red tubercules). The “base” colour of the body seems to vary between light green and to yellow with all shades in between, while the spines seem to range in colour from red, pink to yellow and orange. On top of their light or green “body” colour, some larvae retain black pigment in the final instars mixed with their “base” colour, creating a pattern of black spots/patches on top of the green or yellow larva. In some cases, nearly the entire larva can be black except for the spines. When pupating, some larvae decide to spin an elaborate “double” layered porous cocoon – porous referring to the many tiny holes in the cocoon, which may serve as drainage holes for excessive water to cope with the heavy rains in the rainy season, and also with Madagascar’s high temperatures by means of ventilation. This trait can be seen in other cocoon spinning Saturniidae of Madagascar such as Argema mittrei and Ceranchia apollina, that all of them seem to have cocoons with holes in them. Interestingly enough, a small but significant share of the larvae decide not to spin a cocoon at all, and pupate randomly on the floor – a peculiar trait this species has, although it is unclear if this happens only due to disturbance or stress, possibly by other larvae, or if this happens in the wild aswell and not just in captivity. This species does well on room temperature, and is quity hardy, so it doesn’t require any other special conditoons. Adults usually hatch quite fast, within 1-2 months, however sometimes they decide to skip a season, and may take a while. I’ve had cocoons hatch after longer than 7 months or longer in some occasions – so don’t panic they don’t seem to hatch in a short period of time like they usually do. Moisture triggers them to hatch and develop faster as moths from Madagascar are dependent on the rainy season, while drought will encourange them to suspend their development in the pupae until the conditions are right – spraying with warm water may help. A typical Antherina suraka larva of the green form. 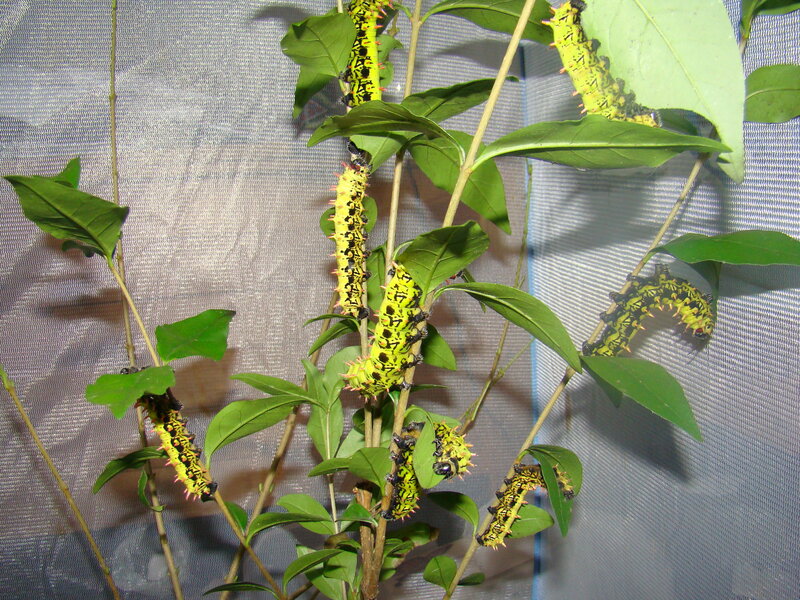 Caterpillars are easily raised on a cut branch of host plant placed in a bottle of water to keep it fresh. In about 1.5 to 2 months time, the larvae should be able to grow from egg to the cocoon stage. Antherina suraka should be a fun species to try for a beginner as they are relatively easy to rear in captivity and are eager to pair. They do seem to be a little sensitive to diseases however, so if you keep them clean, a bit ventilated and not overcrowded, they should thrive in captivity. 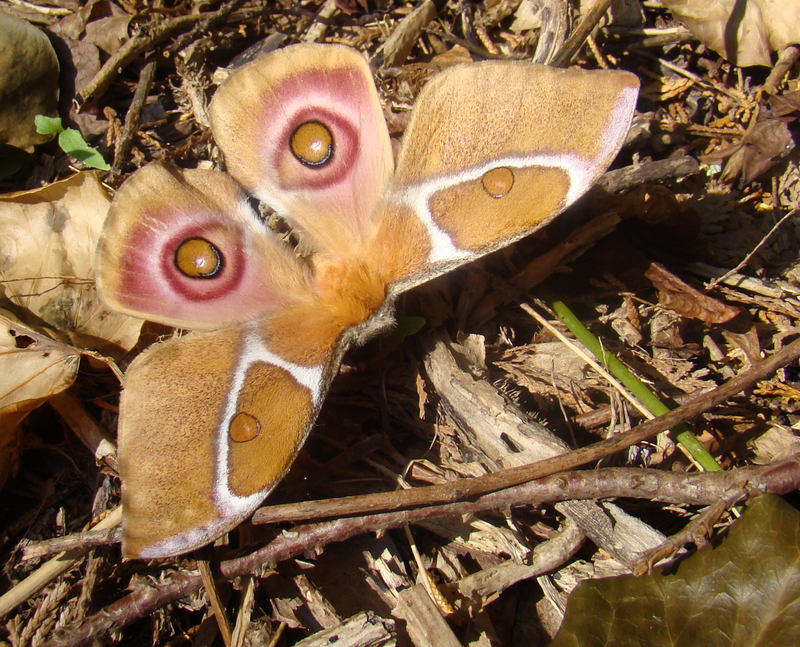 In Madagascar, these moths are also commercially bred, usually for the purpose of silk production – but also the export of cocoons to Europe to hobbyists and breeders. 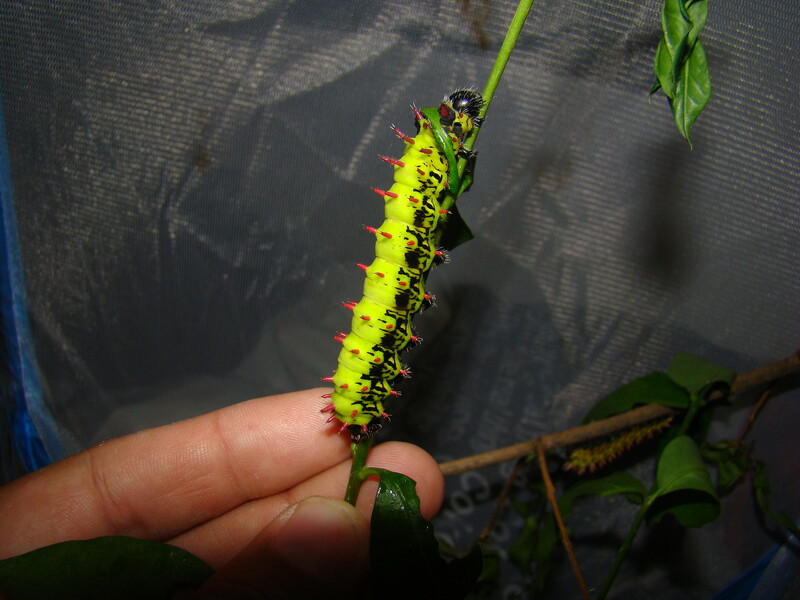 One of my contacts in Madagascar reported to me that the pupae are in fact edible, but only a few days after the the larva has recently pupated! Consuming older pupae made people sick. This could be evidence of defensive toxins (possibly sequestered from the host plant?) 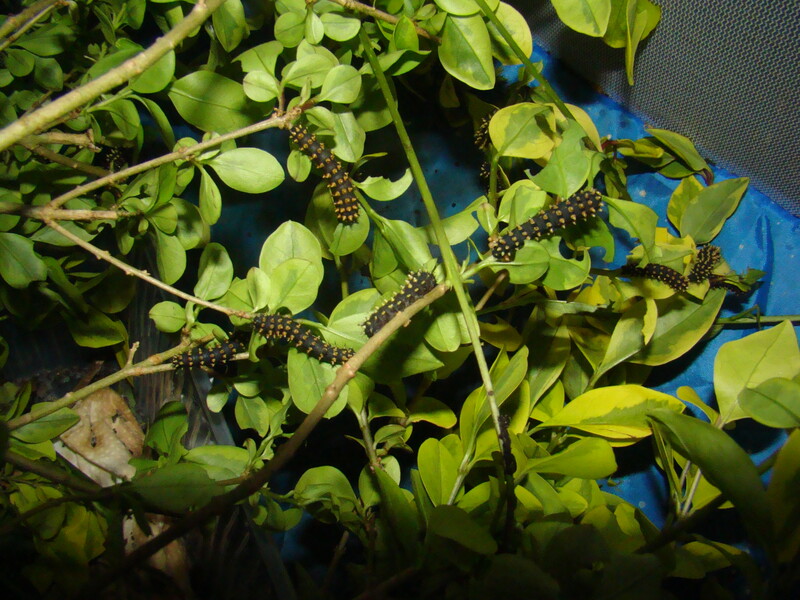 in Antherina suraka – perhaps they form in a later stage after pupation. Interestingly, adults vary a lot in colour. They can be very light or very dark; the lighest specimens are nearly sand yellow or rusty orange, while the darker specimens are brown to grey.